Yesterday the top link on the Reddit futurology subreddit (www.reddit.com/r/futurology) was an article with a headline Mind Reader: Meet The Man Who Records and Stores Your Thoughts, Dreams and Memories. Over 700 readers have “liked” this article. But this article is junk technology reporting. Nobody has the slightest idea of how to record or store thoughts, dreams, or memories (outside of conventional media). The article discusses a company founded by one Donald Marks. The company has some technology for doing brain scanning and storing the results. “"Some people call it 'thought identification' but it is essentially mind reading,” says Marks. “It is the process of recognizing activation patterns in the brain and identifying what thoughts are associated with them." Marks seems to be guilty of shameless overblown hype here, something he has a motive for because he has a financial interest in hyping his own company. The process his company is using is not at all mind reading. No one knows how to do any such thing. There are various ways to scan the brain. 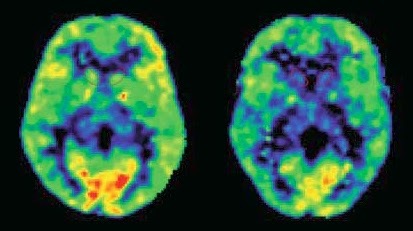 One way is to use functional magnetic resonance imaging (fMRI), which measures change in blood oxygenation. Then there's CT scanning, and a process called PET. Then there's MEG, which measures magnetic fields produced by electrical activity in the brain. Then there's NIRS, another technique for measuring blood oxygenation in the brain. None of these methods give one single bit of direct information about what someone is thinking or perceiving. However, scientists can try an elaborate technique for matching up brain scans taken at a particular time with data about what a person was observing at some particular time, or what a person says he was thinking at a particular time. It doesn't work very well at all, because two person's brains don't look the same way when they are thinking the same thing, or looking at the same thing. Even a single person's brain doesn't look exactly the same way when that person is looking at the same thing or thinking the same thought at two different times. But there does seem to be a little bit of a tendency for one brain to look a little like another brain when they are observing the same thing or thinking the same thing. So scientists are able to do a little bit of what I may call a parlor trick. The parlor trick consists of analyzing sets of brain scans, and studying what a brain scan tends to look like when a particular thought is being thought, or a particular thing has being observed. Scientists can use that analysis to make a very weak limited-scope prediction about a person's thought or observations. Should we call this type of thing “mind reading”? We should not. A proper term for it is brain scan correlation analysis. But such a term does not attract press attention or investors, so people doing such brain scan correlation analysis might resort to hype, and call it “mind reading” instead. Is there much use that we can foresee for brain scan correlation analysis? Not really. It's probably a dead end. It's basically a kind of parlor trick or stunt, good for attracting a few headlines, but not much else. In my local library there are many Chinese books I can't read. I might create a new technique for trying to understand Chinese. I might take pictures of the covers of the Chinese books, and run these images through a computer program that correlates certain pictures on the book cover with Chinese words on the book covers. I could probably get a few results I could brag about using such a technique, which might attract some press attention, with headlines about a new computer program that can read Chinese. But such a technique would really be a parlor trick and a dead end. I would never be able to take it much farther, and never be able to really understand Chinese by using such a technique. Such a technique would be similar to using our current type of brain scans to try to read minds. The items being read in brain scanning are like cloudy blobs, which severely limits the amount of usable information that can be derived from them. If you consider that the same person will have a different set of cloudy blobs when thinking the same thing at two different times (which would differ from the set of cloudy blobs that some other person would produce), it is hard to foresee much use that could be made of such analytics. One application you can think of is creating some kind of lie detector that would work from analyzing brain scans (because the cloudy blobs might look different when someone is lying). But such an approach would probably not be any more accurate than the existing technology of a polygraph. The headline in the story I have cited (referring to “the man who records and stores your thoughts, dreams and memories”) is utterly misleading. What is being recorded is the brain scans of people while they are having thoughts, dreams, or recollections, not the thoughts, dreams, and recollections themselves. The story implies that such storage may be useful because a science of some later age may be able to analyze the cloudy blobs of brain scans more accurately, so that they can figure out memories, thoughts, and dreams from studying these cloudy blobs. There is no reason to be hopeful that any such thing will ever happen. It seems like something along the lines of saying, “Freeze yourself at death, and science will be able to figure out how to revive your body.” We might be able to figure out exactly how thoughts and memories are stored in the brain, but that would require science vastly more advanced than the crude indirect techniques of brain scanning correlation analysis. When will we actually have technology for reading minds? My guess is sometime between 50 years from now and never. Contrary to the hyped claims of modern would-be technological mind readers, we are simply nowhere near to understanding the mystery of how the brain stores memories and how it produces thoughts. Our knowledge of the matter is so limited that we are not even sure whether the brain is the sole agent involved in storing memory and producing thoughts. We might one day unravel such a mystery after many decades of additional study. Or we might never figure it out. I looked to see whether I could find a good list of the 10 greatest moments of human history, but I was disappointed. I found one bizarre list of the 10 greatest moments of human history, which included the atomic bombings that ended World War II and Hitler's appointment as chancellor of Germany (hardly what I consider great moments). Then there was another list which counts long periods of time as “moments,” which doesn't make sense. Then there was a list of “Ten Moments That Changed History” which included the invention of porridge (hardly what I consider a great moment). Perhaps I should try to correct this Internet list shortcoming by trying to write a first-rate list of the ten greatest moments in human history. But instead I'll try something more ambitious: I'll take a stab at making a list of the five greatest moments in the history of the universe. I will consider our entire vast universe of billions of galaxies, and ask: what five moments should be considered the greatest moments in its 13-billion-year history? For this discussion, a moment will be considered as something that occurred within a very short time span. This means items such as “the origin of consciousness” or “the origin of the first technology” or “the first development of science” will have to be excluded, as they apparently did not occur at one particular moment of time. The first choice on the list is an obvious one. Any list of the greatest moments in the history of the universe must include the universe's first moment, the mysterious event known as the Big Bang that occurred about 13 billion years ago. According to scientists, at the time of the Big Bang, the entire universe began to expand from an infinitely dense mathematical point known as the primordial singularity. It's hard to beat that for drama and significance, particularly since the existence of everyone depended on it going just right (scientists say that if there had been a very slightly different Big Bang, none of us would be here). I cannot include the origin of the first galaxy or the origin of the first planet or the first star in my list of the universe's five greatest moments, as they each occurred very gradually over a period of many years. So to find the next item on the list, I must fast-forward billions of years, to the time when microscopic life first appeared in our universe. Which planet had the honor of being the first planet on which life appeared? Almost certainly it was not our planet. Given that there are billions of galaxies, the first planet on which life appeared was almost certainly not even a planet revolving around a star in our galaxy. It was probably a planet in some other galaxy, and the first origin of life in the universe probably occurred billions of years before life originated on our planet. Such an event of fundamental importance must have been completely unrecorded. Given the vastness of the universe, it is very, very unlikely that anyone will ever be able to figure out what was the first planet on which life originated. Another moment in the universe's history that deserves a place on my list is the first moment in the history of the universe when two civilizations existing on different planets were ever able to establish communication. Such an event may have first occurred when two civilizations existing in different solar systems were able to achieve radio communication with each other (something that is much, much easier than making contact by an interstellar voyage). Or it might have been that the first two civilizations on different planets to communicate with each other may have been planets within a single solar system. Given the vast age of the universe, such an event very likely occurred long, long ago, probably millions or billions of years ago. Another great moment in the universe's history must have been the first time that a spaceship from one solar system was ever able to reach another solar system. The distance between stars is so great that it is very difficult to estimate how often interstellar travel occurs. 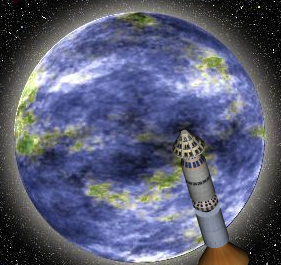 There could be some special physics that allows interstellar travel to occur commonly. Or perhaps there is no such physics, and interstellar travel only occurs rarely, because of the enormous costs and great lengths of time needed for the journey between stars. But very probably some civilization in the universe has launched a spacecraft that has successfully traveled from one solar system to another. The first time any such spacecraft ever reached another solar system might be considered one of the greatest moments in the history of the universe. Another great moment in the universe's history was the first time that intelligent creatures on one planet ever made face-to-face physical contact with intelligent creatures on some other planet, creatures belonging to some entirely different species. This might have been something like a “handshake across the stars,” when an intelligent species in one solar system traveled to a planet in some other solar system, after crossing the vast interstellar void. Or, it might have been something requiring a much shorter voyage. If two planets in a solar system ever developed intelligent life at about the same time, the first interplanetary physical contact between different species might have been merely a case of astronauts from one planet traveling to another planet in the same solar system. Given the great age of the universe, it is likely that this event has already occurred, although we will never know which case of direct contact between different intelligent species was the first such event to occur in the universe's history. Such an event might have occurred after many different interstellar voyages looking to find another intelligent species. We are used to being able to see many of the greatest moments in human history on our television screens, either by looking at photography of the event taken while it happened, or by looking at historical documentaries that describe the event very well. But the last four items on this list will forever be shrouded in mystery. Because of the incredible vastness of a universe consisting of billions of galaxies (each made up of millions or billions of stars), we will never be able to say, “This was the planet where life first evolved in the universe,” or “This was the time when two intelligent beings from different planets first stood face-to-face.” Just as our universe keeps most of its “firsts” hidden, it also keeps most of its superlatives hidden. There's no way to tell what is the biggest planet in the universe or the fastest spaceship in the universe or the biggest city in the universe or the coldest planet in the universe. Even if you restricted yourself to only trying to keep track of the superlatives or firsts of a single galaxy, the job of being a galactic Guinness would be a very, very difficult one. Does the Future Splash on the Present? On the morning of August 24, 2014 around 2:00 AM EST I was woken up by a vivid dream. The dream seemed like the simplest dream I had ever had. It consisted simply of an image of a small metallic trash basket moving a few inches on the floor, without anything else being nearby. I thought about the dream and at first thought that it might be a dream about some ghostly force moving the small trash basket. But then I thought of a simpler idea. Perhaps the dream was about an earthquake tremor. If there were a sufficiently powerful earthquake, that might cause a small trash basket to move around on the floor by itself. Having previously suggested in a blog post that people describe unusual dreams by sending out a Twitter tweet, I decided I would do just that – as soon as I woke up in the morning. I imagined myself sending out a Twitter tweet in the morning, a tweet about a possible earthquake premonition. That would be proof of my premonition if an earthquake soon occurred, because you can't change the time stamp on Twitter tweets. After I woke up in the morning and went to my computer, I discovered there was no longer any point in sending out such a Twitter tweet. The earthquake had already occurred. It happened about four hours after my dream, at about 6:20 AM EST (3:20 AM PST). It was the worst earthquake in the San Francisco area in 25 years. I hope all those who got injured will recover fully. This year I have recorded some 17 dreams I have had that match either events that occurred shortly thereafter, or events that occurred (unknown to me) within the previous few days. The most dramatic case is fully described here. It's a dream I had of a meteor fall that had an uncanny resemblance to something that happened within a week. On June 30, 2014 I had another meteor dream that matched reality well. I dreamed that a meteor made a bright colored flash of light in the sky, and that an observer saw the meteor wearing sunglasses, thinking: I'm sure glad I wore these sunglasses, because that was so bright. That night while I was sleeping a British observatory reported the brightest meteor flash it had ever seen, which witnesses said produced a bright green light (it was a type called a bolide meteor). On April 10 I had a dream about a senior White House official resigning. The resignation of a senior White House official (Sebelius) was announced later that day. On April 16 I had a dream of a power outage at a stadium. There was such an outage on the previous night (unknown to me), and a week later there were two such outages in different places. On April 25 I had a dream of astronauts on the moon carrying radiation shields (stone umbrellas, to be exact). Later in the day a scientific study was released saying that future lunar astronauts will need much better radiation shields. On June 12 of this year I had a dream of a non-elderly adult woman completely underwater in a bathtub. The next day there was a news story of exactly such an event (a drowning), an event that only occurs about once a month to non-elderly adult women in the US. On June 13 I had a dream of someone stabbing a robber who entered that person's house. Within 24 hours (before or after) there were two such events in different places. On July 16 I had a terrible dream of a child falling to his death from about the tenth or fifteenth floor of an apartment building. A day earlier (unknown to me) a 16-year-old described as Turkey's youngest novelist had fallen to his death from the tenth floor of an apartment building. On June 30 I had a dream about homeless people living in a hotel or motel. I learned later that day that there had been a local protest a few days earlier about a nearby motel being converted into a homeless shelter. Then there was the dream discussed here. What I find is that for every case in which one of my dreams seems to match well something that soon happens (which may be an example of precognition), there are roughly an equal number of cases where one of my dreams seem to match well something that happened one day or a few days previously (but which I had no knowledge of). The latter examples may be cases of what is called retrocognition, which means an anomalous knowledge about something that happened in the past. It is very hard to mathematically compute the odds of such things occurring randomly. These cases could all be due to mere coincidence. But let us at least speculate: what type of theory of time might allow for both anomalous precognition (knowledge of a future event) and anomalous retrocognition (knowledge of some past event that you never learned about through normal means)? I can think of a crude sketch of such a theory. Let us imagine time as being like a stream of water. We can imagine ourselves as fish swimming in that stream, or we can imagine ourselves as people walking along the side of the stream. Now let us imagine events as being like rocks or pebbles that fall into the stream. We can imagine that each event causes a little splash or ripple. We can imagine that the bigger and more important the event, the bigger the splash or ripple it produces. Such a theory might help to explain both precognition and retrocognition. Just as the splash of a rock in a stream travels in all directions, we can imagine that some type of paranormal or psychic “event splash” travels both forward and backward in time. When someone has a dream of something about to happen, it might be caused by a “backsplash” of a future event. 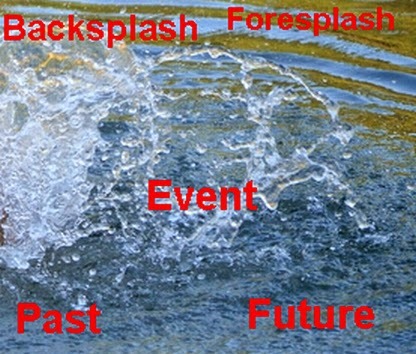 When someone has a dream about something that recently happened (something he never learned about normally), that might be caused by a “foresplash” of the event. I have no idea whether such a theory is valid. But I have at least learned one thing. I must discard my previous policy of waiting until the morning to send out a Twitter tweet when I have a vivid dream of something that might soon be verified. From now on when I have such a dream in the middle of the night, I am going to immediately wake up, turn on my computer, and send out a time-stamped Twitter tweet describing the dream, as soon as my dream is finished. Hopefully if I follow this policy I will one day have a nice juicy case where I can prove I dreamed about something a few hours before it happened. Hints of ET Civilizations Found in 50 Galaxies? There are various possibilities for how mankind might first learn of the existence of extraterrestrial life. 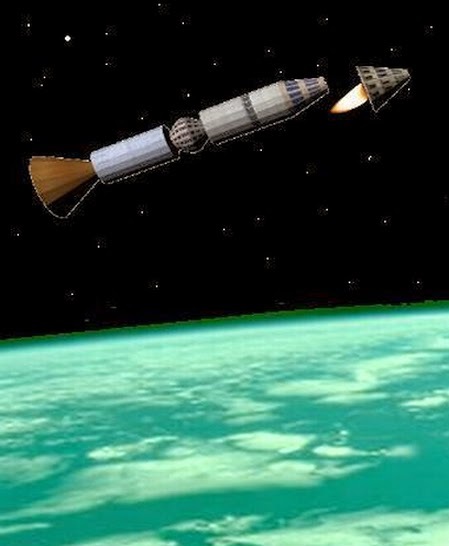 We might one day see a huge alien spaceship heading toward our planet. Or we might sniff out the chemical signatures of extraterrestrial life by studying nearby planets. Or we might get a radio message from extraterrestrials. Or, we might discover extraterrestrial intelligence by detecting indirect signs of large-scale astronomical engineering by alien civilizations. I have always thought the last of these possibilities is quite plausible, and I have argued that perhaps the mysterious hard-to-explain planet Kepler 78b may be an example of extraterrestrial engineering at work. But now astronomers may have discovered evidence of astronomical engineering on a much vaster scale. The finding suggests the possibility of very large-scale astronomical engineering in about 50 different galaxies. Before discussing the finding, I should discuss why the idea of large-scale engineering projects by extraterrestrials is a very plausible one, rather than some far-fetched idea dreamed up by a wild-eyed fantasist. The universe is about 13 billion years old, and intelligent life could have arisen on other planets at any time during the past several billion years. The universe consists of billions of galaxies which each contain millions or billions of stars. There are therefore a huge number of planets on which intelligent life could have evolved, and many eons during which such intelligent life could have appeared. A civilization much older than ours might be expected to engage in large astronomical engineering projects such as building large space colonies, constructing Dyson spheres, moving planets, or breaking up planets and creating space colonies from some of their parts. Such projects, very difficult for us, might be “child's play” for a civilization thousands or millions more advanced than ours. Given all these factors, scientists have half-expected to scan the far reaches of space, and find evidence of the large-scale activities of extraterrestrials. It was hoped that such evidence would show up in the form of “heat signatures” that would take the form of infrared radiation. 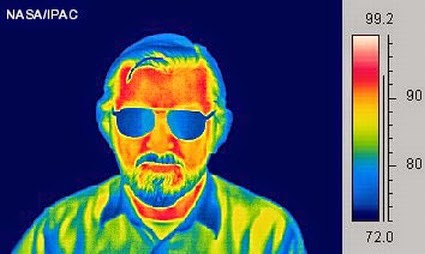 Infrared radiation is given off by all hot bodies. If an extraterrestrial civilization were to be engaging in large-scale engineering projects, this would give off a lot of excess heat which would create infrared radiation that could be read by scientific instruments. But prior to this year, scientists had found no such evidence. Quite a few scientists have said that it is surprising that such evidence has not been found. So we should not be too surprised to hear about the exciting results from a recent astronomical survey. The survey was done by the Center for Exoplanets and Habitable Worlds at Penn State University, using data from a scientific satellite known as the Wide-Field Infrared Survey Explorer (WISE). According to team leader Jason Wright, a galaxy should emit only about 10 percent of its radiation as mid-infrared radiation. But the survey detected about 50 galaxies that are emitting more than half of their radiation as mid-infrared radiation. This is exactly what we might expect to see if these galaxies had been “taken over” by one or more extraterrestrial civilizations that engaged in huge engineering projects that caused excess heat to be emitted. Someone speaking in the style of Erich von Daniken (author of Chariots of the Gods?) might call this excess infrared radiation the heat of the gods. But scientists will need to do more work to rule out natural sources of radiation that might be producing all of this excess heat in these galaxies. Until that is done, we cannot say that proof has been found for extraterrestrial intelligence. But for the time being, we seem to have a tantalizing hint that extraterrestrial intelligence exists, and exists abundantly. When you go to study biology in school, your textbook will refer to a doctrine called the central dogma of biology. This is the doctrine that DNA makes RNA, which makes proteins. There is no doctrine that is generally recognized as a “central dogma of physics.” But it is as if modern physicists have a central dogma: the doctrine that all of the major forces at work in the universe are currently known. It is hard to say exactly when this idea became an ossified dogma of the modern physicist, but it was perhaps around about 1970 or 1980. After discovering the forces of electromagnetism and gravitation centuries earlier, scientists discovered two more forces in the twentieth century: the weak nuclear force and the strong nuclear force. Then somewhere along the line, physicists seemed to erect a great big “Mission Accomplished” banner, rather like George W. Bush's team did on an aircraft carrier a few weeks after the initial invasion of Iraq in 2003. Physicists came to believe that they had figured out all of the important forces at work in the universe. A modern physicist is someone with great confidence that he understands every major force at work in the universe. He is willing to consider that there may be new types of matter that he doesn't know about. He is willing to consider that there may be some unusual type of energy that he doesn't know about. He is willing to consider that there may be whole other universes he knows nothing about. But the modern physicist draws the line at considering the possibility of unknown forces at work in our universe. No, no, no, he thinks to himself, we already have all the forces of the universe figured out. Perhaps we can understand this vaunting affectation if we think of it as a kind of firewall. Admitting any unknown force at the work in the universe might open the door to possibilities many a physicist wishes to exclude, such as the idea that what is going on in the universe is not merely the result of blind chance. To lock out such ideas that make them uncomfortable, physicists cling to the pretension that they understand all forces at work in the universe. Later some serious difficulties arose in understanding the universe. It seemed that the known force of gravitation just was not doing the job adequately at explaining the structure of the universe. None of the other four fundamental forces works on a large scale. The physicists and cosmologist had a choice: they could either concede the existence of some unknown force at work in the universe, or they could start believing that almost all of the matter in the universe was invisible (the doctrine of dark matter). Strangely enough, they chose the second of these beliefs. The average physicist seemed to think: Much better to believe that most of the matter in the universe is some weird, invisible, unknown matter than to believe in the terrifying idea that there is an unknown force at work in the universe. Later on cracks started to show in this model. It seems that the positions and motions of dwarf galaxies are not consistent with the theory of cold dark matter, as discussed here and here. 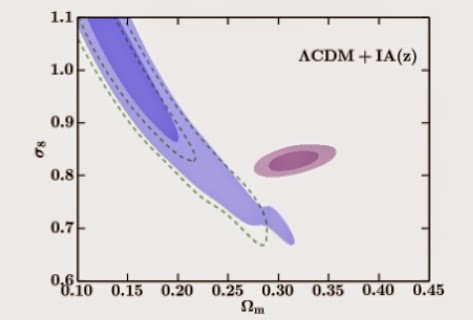 Also, a just-released scientific paper (entitled “Cosmic Discordance”) shows a problem with the cold dark matter model, as shown in the diagram below. The blue part shows estimates made using dark matter theory. The purple part shows data from two major space satellites. The purple part and the blue part are supposed to overlap, but they do not. The deeper blue part and the deeper purple part (the most likely values) are far apart. Message from this graph: we are lost in the cosmic woods. But have physicists now started to doubt dark matter? Have they conceded their approach may be wrong, and that there may be forces at work in the universe they don't understand? No, they're clinging to their cold dark matter theory as zealously as ever. It's needed to prop up the central dogma of physics, that there are no major undiscovered forces. A corollary of this central dogma of physics is that there can be no earthly forces we do not understand. So any paranormal phenomena involving some unknown force is taboo, strictly prohibited. A long-running project involving random number generators around the world has apparently shown deviations from randomness whenever important events happen, as if global consciousness was mysteriously affecting the random number generators by some unknown force. But such results must be wrong, a physicist would tell you, because it involves an unknown force, and we understand all the forces at work in the universe. Such phenomena are excluded on the grounds that they are “occult.” The word “occult” simply means hidden, but what could be more occult than the physicist's assertions that most of the universe’s matter is some invisible, unknown, hidden type of matter (dark matter)? We saw this central dogma of physics at work recently when two sets of tests (including one done by NASA) indicated that some new type of space drive works, apparently using some new type of force. Physicists jumped quickly to their keyboards to in effect tell us: the tests can't be right, because there can't be some new force we don't understand. Perhaps the best way to refute the central dogma of physics is to consider the Big Bang, the explosive origin of the universe. According to modern science, the entire universe began to expand from an infinitely dense mathematical point about 13 billion years ago, a point called the primordial singularity. Can we really claim that we understand all the forces that were involved in that infinitely strange event, or that it only involved the forces known to us? Can we have any confidence that such an unfathomable event of infinite mystery involved only the small number of forces we know of? Of course not. At some time in the future a wiser generation of physicists will realize that our knowledge of the universe is merely fragmentary, and that the universe is greatly affected by mysterious forces and phenomena that we know nothing about. Scientists will realize that they have been like little children playing at the seashore with a few interesting shells, while the great ocean of truth lay undiscovered in front of them (to borrow a great simile from the great physicist Isaac Newton). 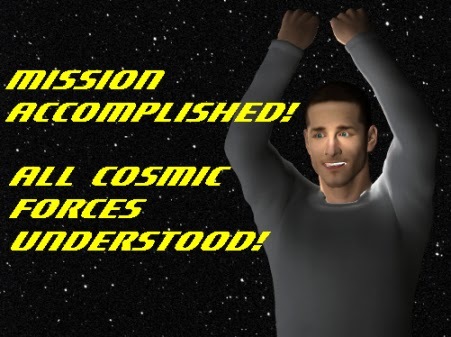 Scientists will then take down the “Mission Accomplished” banner raised prematurely by a generation of physicists who thought they had figured out all the forces at work in the universe. Sometimes when nature takes away something, it seems to give something back in return. One such case seems to be the case of savants – people who have unusual mental abilities despite having other mental shortcomings. An example of a savant is Daniel Tammet, who has been diagnosed with Asperger Syndrome. He holds the European record for reciting Pi from memory, to 22,514 digits. Supposedly he learned the Icelandic language in only ten days. Another example of a savant is the late Kim Peek, who supposedly could accurately recall the details of 12,000 books he had read, despite having an IQ of only 87. Like several savants, he had the ability to instantly calculate the day of the week on which any person he met was born. You can find other similar cases on the web site of Darold Treffert, a doctor who has been studying such cases for many years. Leslie–blind, cognitively impaired and with such spasticity in his hands that he could not hold a fork or spoon to eat—had become a accomplished pianist, never having had a piano lesson in his life. Somehow the hand spasticity magically disappears when he sits at the keyboard. The 1983 60 Minutes program, which many still remember, recounted in detail the astonishment of Leslie’s mother, May Lemke, one evening, when Leslie, age 14, played back Tchaikovsky’s Piano Concerto No. 1 flawlessly, having heard it earlier for the first time that evening as the soundtrack to the movie Sincerely Yours. Dr. Treffert has expressed interest in a recent case that might be the most spectacular case of a savant ever: the case of a young autistic Indian girl named Nandana who can supposedly read her mother's mind with a high degree of accuracy. The case was reported in this news feature. Newspaper reporters visiting Nandana said, “We were left amazed and totally impressed when Nandana passed our tests with flying colors.” They tried a test in which the mother was given a piece of paper with the digits 044050799. The child then typed those digits exactly, which she apparently had not seen. In a second test the mother was given a note saying, “Can I have some warm water, please?” The child reproduced the text, with some spelling errors. The mother was then brought to a different room, and asked to think about an object. She thought of a biscuit. The child was brought back in from the other room, and specified biscuit as the object her mother was thinking of. 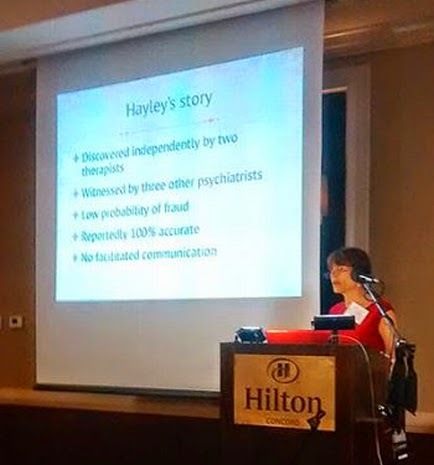 Recently there has appeared another case of an alleged autistic mind reader. This case seems to have been investigated under controlled scientific conditions. The reported results are as spectacular as the previously reported tests with Nandana. Data from the first session with Therapist A includes 100% accuracy on three out of twenty image descriptions containing up to nine letters each, 60 to 100% accuracy on all three of the five-letter nonsense words, and 100% accuracy on two random numbers: one eight digits and the other nine. Data from the second session with Therapist A includes 100% accuracy on six out of twelve equations with 15 to 19 digits each, 100% accuracy on seven out of 20 image descriptions containing up to six letters, and between 81 to 100% accuracy on sentences of between 18 and 35 letters. Data from the session with Therapist B showed 100% accuracy with five out of twenty random numbers up to six digits in length, and 100% accuracy with five out of twelve image descriptions containing up to six letters. There was no evidence of cueing or fraud. of the entire room, the therapist and child, and their separate workspaces. All cameras were synchronized and time-stamped. This sounds like potentially bulletproof evidence for mind-reading. But there's only one problem: the tapes haven't been released. One Facebook user says that he was invited to watch the tapes, and that they are five hours of very convincing evidence. But until these tapes are released, not many doubters will be persuaded. I will update this blog post if the tapes are ever released. Postscript: Powell gives some more details here. She claims she hasn't posted the video to YouTube because the family wants to remain anonymous. Why is it appropriate to use that term to describe man's knowledge of nature? It's because what we know is very, very small compared to what we don't know. It's also because many of the theories that we have to explain things don't do a very good job of explaining what we need to explain. Let's look at some fields of knowledge and consider how little we really know. First we may look at the field of astronomy. According to astronomers, the universe consists of billions of galaxies, each with millions or billions of stars. A reasonable estimate of the number of planets in the observable universe is something like 1,000,000,000,000,000,000, but we know something about no more than about a thousand of these, less than a thousandth of a trillionth of the total. So what we know is like chicken feed. There is the great mystery of Fermi's paradox, why we have not yet been contacted by alien visitors. The answer is entirely unknown. Above and below our galaxy are mysterious Fermi bubbles, which "defy explanation" according to a leading physics web site. There is the recently discovered mystery of the universe’s “missing light,” which leaves our experts stumped. Then there is the mystery of what caused the Big Bang, which is completely unknown to us. There are unexplained mysteries such as the non-random spins of spiral galaxies, and the strange alignment of quasar polarization vectors. There is the great and deep mystery of cosmic fine-tuning. There is the mystery of inexplicable planets. Even in our own cosmic backyard, we see mysteries we can't explain, such as an asteroid that is holding together even though it shouldn't be. To try to explain the current structure of the universe, scientists have tried to patch together theories using gigantic unobserved fudges such as dark energy and dark matter. But thus far these attempts are not working very well, and can't explain well the behavior and positions of dwarf galaxies. So in terms of cosmology and astronomy, our knowledge is fragmentary. But if we confine ourselves only to our own planet, then do we find that our scientists have things well-figured out? No. Talking to some scientists, you might get the idea that we have a good grasp of such issues as the origin of life and the origin of the human mind. But we do not. These are mysteries that we do not currently have a good explanation for. The theory of Darwinian biological evolution (which ably explains quite a few things) falls far short in explaining how the basic requirements for life (such as DNA molecules, the genetic code, and RNA molecules) got started. There are also many subtle characteristics of the human mind which are hard to account for under the theory of natural selection (largely because they do not fit the “fitness for survival until reproduction” idea). 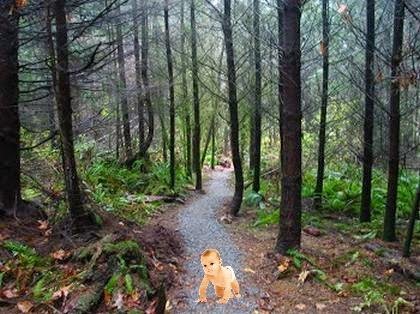 The limits of our biology knowledge have been highlighted by recent news stories such as the story that plants are apparently communicating with each other, and a scientific analysis concluding that parents are apparently transmitting characteristics to each other through some way that genetics cannot account for. Looking to the field of neurology, we have no understanding of the most basic issue of how it is that inanimate matter produces thought. There are also numerous anomalies of the human mind that prevailing theories of the human mind fail to explain. There is abundant evidence for phenomena we have no explanation for, and our typical response is to go to any extreme to explain away such evidence, rather than admit the humbling idea that there are some parts of nature we can't explain at all. A student in high school may stand in awe of human knowledge. He may look at a textbook in physics or biology and say to himself, “Wow, these scientists have it all figured out.” But if we think of books and knowledge, we should think of the totality of knowledge as a vast library hall filled with towering book shelves, a hall that stretches on for miles and miles. We have merely acquired a few books in that vast library. Imagine some children invited to a huge mansion. They are led to a little room in the mansion, where they find some jigsaw puzzle pieces on the floor. They work hard to assemble the pieces. When it seems like they are almost finished, they open the back door of the room, to find someone to whom they can triumphantly brag, “We have almost finished the puzzle!” But the door leads to a vast hall, which is empty except for 10,000 scattered jigsaw puzzle pieces on the floor. We are currently at the stage of these little children opening that door. Very pleased with our ourselves with the work we have done, we fail to see that we have not yet assembled a hundredth of the pieces of the cosmic jigsaw puzzle. A surprising fact is that between 1975 and 1995 the United States spent many millions of dollars investigating psychic phenomena. The investigations originated out of fears of falling behind the Soviet Union in this area (the Soviets were believed to have a vigorous program of psychic research). The US programs went under a variety of names, including the famous STARGATE program to investigate remote viewing (the alleged ability of certain people to gain knowledge of remote locations through paranormal means). In 1995 the government paid a group called the American Institutes for Research to evaluate the program. The group issued a report recommending that the research be canceled, and it was. But many thought there was something very strange about this sudden termination of the program. If the remote viewing programs had not been producing positive results, why were they funded for twenty years? If humans are not capable of remote viewing, it should have taken no more than twenty days to discover that through testing, not twenty years. In fact, there is every reason to think that the US government investigations into psychic phenomena were extremely successful, in terms of providing substantial evidence for the reality of certain paranormal phenomena. The historical record indicates that the US government experiments on remote viewing did produce positive results time and time again. One remote viewer, Joe McMoneagle, was awarded a Legion of Merit award for his successful remote viewing. A remote viewer working for the US government was apparently able to detect details of a new type of Soviet sub before its existence was known to the US government. There were numerous other remarkable successes, some involving the famous psychic Ingo Swann. Swann was reported to have detected rings around Jupiter at a time before such rings had been discovered by US spacecraft. Using the standards applied to any other area of science, it is concluded that psychic functioning has been well established. The statistical results of the studies examined are far beyond what is expected by chance. Arguments that these results could be due to methodological flaws in the experiments are soundly refuted. It is clear to this author that anomalous cognition is possible and has been demonstrated. This conclusion is not based on belief, but rather on commonly accepted scientific criteria. It was only by some very implausible mental gymnastics and sophistry that other writers in the report were able to argue against the US research on remote viewing. In a “the evidence be damned” kind of triumph, the skeptics won out. In 1995 the United States closed down its programs involving psychic research. As it happens, this was almost precisely the worst possible time to have made such a decision. This is because one year later Osama bin Laden and his followers declared war on the United States. The US wanted to find bin Laden, but could not. Let us ask: how might things have gone differently if the US had not abandoned its paranormal programs? What might have happened if the US had decided to continue to give healthy funding to paranormal defense-related programs in 1995? For one thing, there might have never been a 9/11 attack on September 11, 2001. This is because we might have been able to use remote viewing and similar techniques to get a good idea of exactly where Osama bin Laden was. Then we might have eliminated him by means of a cruise missile launch, long before 2001. If remote viewers had been able to determine bin Laden's location, it would have been a success less remarkable than other successes logged during the US investigations into remote viewing between 1975 and 1995. If the US had taken psychic research seriously after 1995, we might also have got a “heads up” regarding the attacks on the World Trade Center. As Dr. Larry Dossey documents abundantly in his very fascinating book The Science of Premonitions, there are numerous cases of people who have had dreams or premonitions that seemed to warn of a disaster that eventually occurred. I don't claim to have any unusual psychic abilities, but several months before the World Trade Center attack I had a dream of the World Trade Center collapsing. Other people had similar dreams or premonitions, which might have arisen either from real precognition or from simple ESP in which a person in one place somehow picks up the thoughts of distant people plotting an attack. What if the US had taken seriously the idea of encouraging people to report dreams or premonitions of disaster? It might have established some kind of hotline for reporting such dreams or premonitions. In 2001 federal authorities might have noticed a spike in reports of dreams or premonitions about a World Trade Center disaster. The FBI might then have begun diligently investigating all means by which the World Trade Center could be attacked, including a greater investigation of pilot-training schools with foreign students. This might have exposed the plot and prevented the World Trade Center attacks. If we consider the years 2002 and 2003, we see cases in which the USA might have achieved its ends for very little money, by using the fruits of paranormal research. The remote viewing process investigated with apparent success between 1975 and 1995 might have been used to help determine the location of Osama bin Laden, who could have been taken out with a cruise missile. Remote viewing also could have been used to help determine the location of Saddam Hussein. Regime change might then have been accomplished with a single cruise missile launch, instead of a full ground invasion. Remote viewing also could have been used to help rule out the faulty hypothesis that Saddam Hussein had weapons of mass destruction. Remote viewers could have been trained to focus on targets in Iraq. If none reported any weapons of mass destruction, it would have helped to discredit such an idea. The main person from Iraq who suggested such a hypothesis was an intelligence source known as Curveball. This person told a story that Saddam Hussein had an active and massive program to develop weapons of mass destruction. The story turned out to be a great big lie, but the US government fell for it hook, line, and sinker. Psychics could have been used to help determine that the person was lying. Given reported powers far, far greater than being able to tell whether someone is lying, this might have been child's play for such psychics. In short, reviewing the events that occurred between 1995 and 2003, we see quite a few cases in which the USA might have avoided becoming involved in two major wars, if only we had simply believed the results of the experiments we had conducted between 1975 and 1995, and taken appropriate followup efforts to make use of such findings. Instead, we basically kind of said, “That can't be right,” and threw the valuable results of twenty years of government research into the trash can, at exactly the worst time (1995). I estimate that the cost of such a mistake may have been between 2 trillion dollars and 4 trillion dollars, the latter being the total price tag of the wars in Iraq and Afghanistan, including future medical care for the many injured US soldiers. Four trillion dollars is $4,000,000,000,000.00. 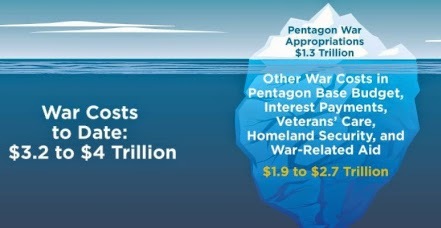 The graphic below (from the Watson Institute at Brown University) illustrates the cost of the wars that might have been prevented. In 1995 the US may have acted just like an infantry soldier who throws away his binoculars the night before a crucial battle. I remember long ago when I was a teenager hungry for knowledge about the universe that fascinated me even then. Back in those days there was no internet, nor were there any of the great science cable TV shows that we now have. So to quench my thirst for knowledge about science and the universe, I would almost always use the public library. There were two great magazines I would read: a thin little weekly called Science News, and a monthly called Scientific American. Science News seems to have undergone almost no change in the past 40 years, and when I see a copy now in the library I get a kind of time-warp sensation. But the Scientific American magazine seems to have changed. Perhaps the editors have felt a need to resort to sensationalism in order to keep up their readership. We have an example in the latest edition. The cover is dominated by a huge headline: The Black Hole at the Beginning of Time. When we go to a page on their online site, the headline says: The Black Hole That Birthed the Big Bang. Wow, so I guess with this breathless headline, scientists must have finally figured out that “origin of the universe” thing, right? Wrong. The article in question is a discussion of a purely speculative theory, a theory that is one of the wackiest and most ornate pieces of baseless speculation since the Maori story that all of creation stems from the six sons of a primordial couple named Rangi and Papa. I would link to the Scientific American story directly, but it is blocked by a pay wall. But the same theory advanced by the same authors is found at this link. We describe a braneworld description of cosmology with both 4d induced and 5d bulk gravity (otherwise known as Dvali-Gabadadze-Porati, or DGP model), which exhibits this feature: The universe emerges as a spherical 3-brane out of the formation of a 5d Schwarzschild black hole. Here the 4d and 5d refer to dimensions. The authors are speculating about dimensions other than the known three dimensions of width, height, and depth. This should immediately alert us that they are engaging in a baroque flight of fancy, rather like someone speculating about vast galactic empires. What does this phrase “braneworld description of cosmology” mean? Braneworld cosmology might be described as an ornate speculation built on top of a baroque speculation built on top of an intricate speculation. Let's sort out the tower of speculations. At the bottom of the tower of speculations is supersymmetry, an ornate theory for which there is no evidence (some say it is on “life support” after Large Hadron Collider observations have failed to back it up). Built on top of supersymmetry is string theory, an even more ornate theory which also is not supported by observations. Then built on top of string theory is brane cosmology. As wikipedia notes in its article on brane cosmology, “There is no experimental evidence for this hypothesis, nor is there any definite need for the brane multiverse in M-theory or string theory.” Then built on top of brane cosmology is the new theory of Afshordi, Mann and Pourhasan. So their theory is an ornate speculation built on top of an ornate speculation (brane cosmology) built on top of an ornate speculation (string theory) built on top of an ornate speculation (supersymmetry). What is hilarious is that some people must be seeing Afshordi, Mann and Pourhasan's theory featured on the cover of the venerable old magazine Scientific American, and many such people must be confusing the theory with science, which it is not. It is actually a super-speculative theory very distantly related to scientific observations, which is an entirely different thing. The following visual illustrates the point. We see a yellow circle representing science. To its left we see a blue circle representing speculations based on science. There is a big arrow pointing from the blue circle to a trashcan. This is because most speculations based on science end up being discarded. There is a much smaller arrow pointing from the blue circle of speculation to the yellow circle of science. This represents the small number of speculations derived from science which end up becoming established science. Afshordi, Mann and Pourhasan's speculations are very much in the blue circle, not the yellow one. Their speculations have an overwhelming likelihood of ending up in the trashcan. Sadly, magazines such as Scientific American cause people to confuse something in the blue circle as something in the yellow circle. According to a Science Daily article, part of the inspiration for Afshordi, Mann and Pourhasan's theory is a dissatisfaction with the standard cosmological theory that our entire universe arose from a point of infinite density called a singularity. Yes, quite a mystery; but that mystery persists. There is a certain type of sensationalist that I might call an inkblot sensationalist. I derive the term from the psychological testing technique of giving someone an inkblot, and asking him to tell what the ink blot represents. The technique was pioneered by Rorschach, who found that people would give all kinds of imaginative interpretations when presented with ordinary ink smudges. An inkblot sensationalist is someone who takes some murky blob of pixels, and interprets it in some sensational way, as a sign of some thing of enormous significance. A recent example of inkblot sensationalism was the television program Aliens on the Moon: The Truth Exposed. The program consisted mainly of sensational interpretations of magnified lunar photographs, suggesting that some of the blurry pixel blobs were signs of alien bases and alien mining activity. But it may be that if you look through thousands of photos of purely natural landscapes, and magnify them sufficiently, with sufficient imagination you can find something that looks to you like artificial activity, even when nothing is there. Below is the latest lunar example of inkblot sensationalism. 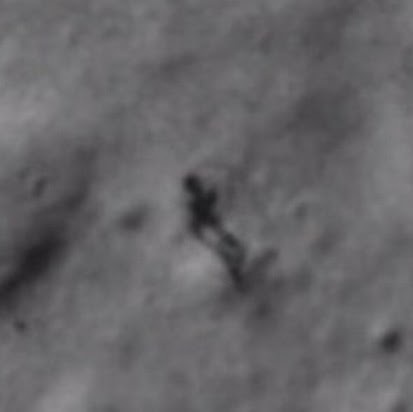 Someone has found what looks like a man and his shadow on the moon. That seems pretty exciting, until you realize that it really looks more like a shadow and its shadow, not a man and his shadow. Another example of inkblot sensationalism is when a paranormal investigator posts a photo with a little white smudge or white blur, implying that is possible evidence of a ghost. Having just read the sensational story of the ghosts of flight 401, I would not at all exclude the possibility that a ghost might be photographed. But if you are going to claim to have evidence of a ghost, it had better be something more than just a blurry white smudge on your photo, as such smudges can be produced by fingerprints on a lens, insects flying near a lens, or a speck of dust floating in the air. 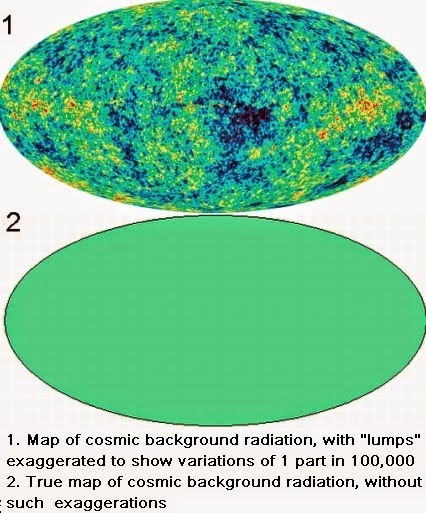 The idea of trying to find evidence for other universes by looking at features of the cosmic background radiation in our universe seems like a quixotic quest (I will avoid the less polite term “fool's errand.”) Even if we were to find a particularly striking feature in that radiation, it would merely tell us something about our universe or its history, rather than being an indication of some other universe. It should also be noted that the cosmic background radiation is essentially featureless, because it is uniform to 1 part in 100,000. The visual below illustrates the point. Recent findings have not been kind to Mersini-Houghton's thesis. Using the latest and greatest observations from the Planck satellite, no less than 175 scientists co-wrote a paper last year concluding that there is no evidence for Dark Flow. They said flatly, “There is no detection of bulk flow.” You can read here a New Scientist story reporting on this paper. The story says, “The sharpest map yet made of light from the infant universe shows no evidence of 'dark flow.'" Now there is a new scientific paper that casts doubt on other items on Mersini-Houghton's list. The paper is entitled “Planck CMB anomalies: astrophysical and cosmological secondary effects and the curse of masking.” The paper refers to a process called masking, whereby scientists subtract foreground signals to try to get at an underlying background signal. Imagine if you have planted a tape recorder in the home of a mobster who is unaware of eavesdropping devices in his house. Perhaps the mobster always turned on the radio while he was talking, so that no one could detect his words. You might then create some technique for subtracting the sound of the radio, to get at the background signals of the mobster's voice. That would be an example of masking. Scientists use similar techniques to “mask out” foreground signals to get at background signals such as the primordial cosmic background radiation, believed to come from the very early universe. The authors of the new paper (discussed in this phys.org article) point out that this masking process seems to exaggerate certain parts of the cosmic background radiation. The authors argue that the so-called “Axis of Evil” is not a significant feature of the cosmic background radiation, nor is the “cold dark spot.” The authors suggest that these are merely spurious artifacts of this masking process. This finding (along with the earlier Planck team's finding of no “dark flow”) pretty much means that the main parts of Mersini-Houghton's “evidence for another universe” have dissolved like the morning mist on San Francisco Bay. “So how did we get in the mess we're in now?” asked Alan. “How did they do that?” asked Alan. “You call him a cyberzombie?” said Alan. 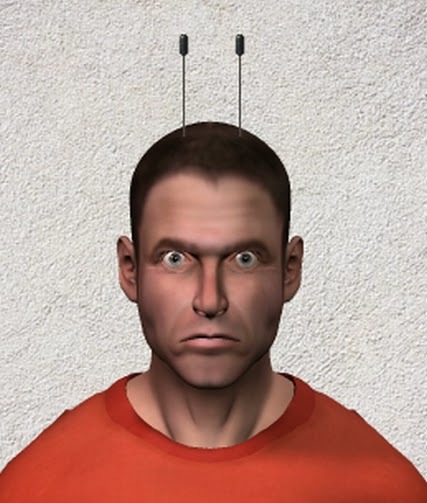 “So when you see a human with two antennae sticking out of his head, that means he's a cyberzombie?” asked Alan. After talking with his mother, Alan went outdoors and practiced some target shooting, wondering when the day might come that he would be face to face with a cyberzombie. After the war had started between the robots and the humans, Alan and his mother had fled New York City, retreating to a tiny house in upstate New York, near the Adirondack mountains. They thought they would be safe there. But they kept hearing about more and more cities being taken over by the robots and the cyberzombies. Alan and his mother dreaded the day when a cyberzombie would appear on their doorstep. Alan was haunted by the memory of something he had seen before fleeing New York City. One day he had knocked on the door of his best friend Tim to ask him to play. When the door had opened, he saw Tim's mother, who had a blank stare on her face, and two antennae sticking out of her head. Tim also had the same blank stare and the antennae sticking out of his head. Sensing danger, Alan had run away. Now he understood the hideous truth about what had happened to his friend. A few days later, there was great news. “Saved by the nerds!” exulted Alan. One of the main arguments against theism is called the argument from evil. This argument basically says that if a deity existed, he would not allow evil to exist. But before accepting such an argument, we must ask ourselves: could there actually be a universe without evil? It may seem very easy to imagine such a universe. We simply imagine a universe filled with planets containing only happy, smiling people. Wouldn't that qualify as an "evil free" universe? But we commit a fallacy when we imagine such a universe, a fallacy I might call the snapshot fallacy. The snapshot fallacy is the fallacy of assuming that we can get a decent model of a possible universe by describing a single moment of time in that universe's history. A universe is not a static thing, but something that persists for billions of years. So any model or idea of a universe (whether scientific or philosophical) must consider not just one moment of time, but a huge length of time – a billion years at least. A person using the argument from evil might say: no problem, we can just imagine a universe without evil existing for a billion years – a billion years of happy planets filled with nothing but happy smiling faces. But would such a universe actually be a universe without evil? I think not. It seems that such an “evil free” universe would actually have some very serious evils of its own. Below is a list of some of them. One great evil of such an “evil free" universe is that it would be boring. Imagine you have been living in such a universe for a thousand years. 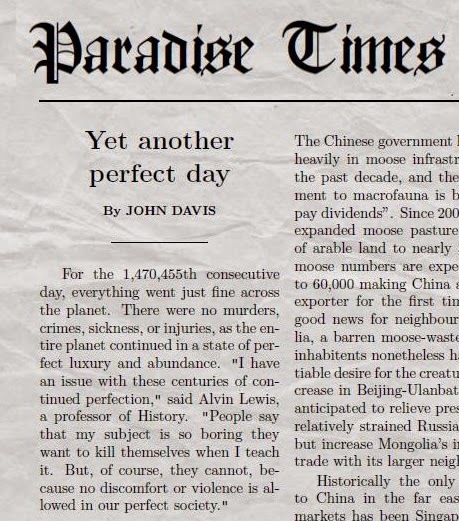 You wake up one day and say “Let me check the news.” You go to your favorite news web site, and the main banner says, “Another perfect day.” You click on the smaller headlines looking for something interesting, but it's hard to find something very interesting. They're all just stories about perfect people having perfect days. You certainly can't go out and do something dangerous, since neither death nor serious injury is allowed in your universe. Very bored, you turn on your television, trying to find an interesting movie. But the movies are boring. There has been no war, death, or illness in your universe. No one has ever faced any real danger, since neither serious injury nor death are allowed in your universe. So while you might be able to find a mildly interesting movie like Meet the Fockers or When Harry Met Sally, you cannot find any really stirring movie such as Gone With the Wind, The Godfather, Doctor Zhivago, or Titanic. Now imagine that this goes on for thousands and millions of years. You eventually are so bored with your living that perhaps you yearn for the escape of death – but that cannot ever happen, because death is an evil, and you are in an “evil free" universe. Do you get the idea? It's the very real evil of boredom. Consider your freedom in the universe we currently live in. You have the freedom to be good, and also the freedom to shoot someone. You have the freedom to give money to charity, and the freedom to steal money from your local church. But how would things be in an “evil free” universe? Presumably you would not have such freedom. You could only speculate on how things might work – perhaps if you wanted to shoot someone, your gun would suddenly be too hot to handle, or your hand would get a jolt of electricity from the sky. Or, if you tried to steal money from your roommate, perhaps you would suddenly become immobile. Regardless of how it would work, the result would be that you wouldn't be so free. We regard freedom as being a very great good. We are told again and again: it's okay to empty our country's treasury (or go deep into national debt), and okay to lose lives and limbs of our soldiers, because they are fighting for freedom. So if freedom is such a great good, what should we call a lack of freedom? We might call it an evil. Indeed, we might call the restrictions on conduct in an “evil free” universe to be itself an evil – an evil we might call the evil of restriction. One of the most central aspects of our universe is the opportunities it allows for different types of rising from a lower state to a higher state, or from a less desirable state to a more desirable state. Such opportunities can exist on a personal level, a national level, or a planetary level. A person can rise from a state of poverty and ignorance to a state of wealth and wisdom. A nation can rise from a lowly, primitive state to a much more exalted and advanced state. A species can arise from a cave-dwelling state to a star-exploring state. One can use the words progress or evolution to describe such risings from a low state to a much higher state, but our language is weak in words to describe such ascents. But such risings from low states to higher states are the life blood of the stories that hold our interest. But what if there were no such opportunities? What if we lived in a universe in which everyone had the same kind of life-story, a life-story that could never be something like “I traveled a long journey upward from the lowly anguish of poverty and ignorance, and ascended to the top of the mountain” but could only be something like this: “I started out thousands of years ago in a state of complete comfort and happiness, and now here I am centuries later, still existing in that same state of comfort and happiness”? And what if the tale of every country and every species was never anything more stirring than this: “They started out in a perfectly desirable state, and always kept existing in that same perfectly desirable state, ending up after their long journey exactly as they were when they began”? There would, of course, be a certain problem with such a situation, and we might call that problem the evil of stagnation. If we have experiences with suffering, unhappiness and hardship, this makes us more likely to appreciate and enjoy times of comfort and happiness. But imagine if there had never been suffering, unhappiness, or hardship. Would we appreciate the comfort and happiness we had? No, we would not. In fact, we would be completely blasé and complacent about our pain-free life. We would be like some spoiled “silver spoon” billionaire's son who never fully appreciated a delicious meal and stylish, roomy houses and fine clothes because he had never experienced anything else. The result would be a serious evil: the evil of non-appreciation. It's easy to say that this would not be a big factor, but some simple math suggests otherwise. Let's imagine a person named John who has a 70 year life with some unhappiness and hardships, followed by a million year afterlife of heavenly bliss. Then let's imagine a person named Bill who experiences nothing but a million and 70 years of comfort and happiness. Suppose that John's experience with unhappiness and hardships makes him enjoy his afterlife 10% more because he appreciates it more. The result may be that John experiences a total net amount of happiness more than 9% greater than Bill experiences, even taking into account John's 70 years of unhappiness. Nowadays many people regard diversity as a good. For example, colleges often proudly say: we don't want uniformity and homogeneity in our college; we value diversity. Diversity is a good thing. We might say that one of our universe's best characteristics is its very high degree of diversity. On our planet we have a very high degree of diversity in life forms and in human beings. But the universe offers much richer diversity. Considering the universe as a whole, we might consider with awe the staggering degree of diversity it contains. There is a diversity of life forms, a diversity of histories, a diversity of physical locations, an unimaginable degree of variety. This has non-trivial consequences. For one thing, it means that exploring different planets in the universe (whether physically or by receiving radio or television signals) will prove to be a source of endless abundant pleasure and fascination, because there is such a huge variety of planets. But imagine there isn't so much variety. Imagine things are much, much more monochromatic, because every planet is in a state of perfection. This lack of variation and variety is itself a certain type of evil, which we might call the evil of low diversity. These considerations lead to an important conclusion: viewing a universe from a proper perspective that includes huge vistas of time, it must be said that every possible universe has serious evils. While a perpetually pleasant pain-free universe may seem like an “evil free” universe if one considers it at a single instant of time (the snapshot fallacy), as soon as we fully and vividly imagine that universe persisting on in such a state for billions of years, we realize that such a universe would actually have serious evils such as the ones I have listed. One cannot evade such a consequence by imagining that the “evil free” universe lasts for a relatively short length of time, for such a universe would then have the evil of death, and the evil of its one demise. Nor can we imagine a truly evil-free universe by imagining an unpopulated universe, as that universe would have its own evils such as evils of low-diversity and evils of non-experience. I may note that my list of five evils of an "evil free" universe is by no means complete. There are no doubt quite a few others that I have not mentioned. If there is a life after death, how long does it last? If there is a life after death, what percentage of people experience bliss in such an afterlife? If someone first experiences earthly sadness and then moves on to a blissful state in an afterlife, will he enjoy such a state only slightly more (because of greater appreciation and contrast), or will he enjoy it very much more? Do the civilized species on planets such as ours eventually reach a state of great abundance and comfort because of scientific and technical progress? Do such civilized species typically exist in such a state for a period many times longer (possibly thousands of times longer) than the time length that they exist in widespread discomfort? If the latter hypothesis is true, could it be that the number of civilized species now existing in abundance and comfort is many times greater than the number of civilized species such as ours (considering the universe as a whole)? What is the ratio between these two numbers? Could it be as high as 100 to 1 or 1000 to 1, given the great age of the universe? For the average person living in our universe, what is the ratio between the number of years spent living in happiness and the number of years spent living in unhappiness (including time spent living in an afterlife)? Under some sets of answers to these questions, we might judge that a perpetually pleasant universe is superior to our own universe. Under other plausible sets of answers to these questions, it might be right to judge that a perpetually pleasant universe is no better than our universe, or inferior to our universe. This point can easily be supported with specific hypothetical examples, but I will save that for another blog post. Here I may briefly note that in any universe in which the ratio of happiness to misery is very high (say 100 to 1 or 1000 to 1), considered over a billion-year time span, there is a large possibility that the existence of suffering and pain may be ultimately justifiable largely on the grounds that it leads to a greater net ratio of happiness compared to unhappiness or pleasure compared to pain, partially because of factors discussed above. Because of the possibility of an afterlife, and the possibility that our planet is untypical (being inhabited by an unusually primitive civilization), it is entirely possible that we live in a such a universe. The possibility of an afterlife cannot be excluded in such a discussion, as it is a possible consequence of the existence of a deity, which is exactly what is being debated. We do not know the answers to the questions listed above. So we are in no position to judge whether our universe is inferior to some perpetually pleasant universe that we can imagine. This is one reason why the main argument for atheism (the argument from evil) is not valid. Another reason the argument is not valid is that a theist can defeat it (with great simplicity) by simply conceding the possibility of a deity with somewhat less than infinite power. Is Kepler-78b a Sign of Astronomical Engineering?